The release of Ford’s new aluminum bodied F-150 has caused a tidal wave of positive outpouring. In fact, many are near-fanatical in their support. But who can blame them? There have been so many positives about the decision (fuel efficiency, performance, no rust) that it just seems natural to roll with the tide. However, as with anything, there has been some negativity swirling. One common negative talking point concerns whether or not Ford’s new aluminum formula is actually more durable than steel. Ford, of course, is adamant that it in fact is, saying their bodies are constructed from military-grade alloys that are more durable than steel. Ford may have some evidence to support them in this arena, but the list of consumer complaints doesn’t stop there. Another major problem Ford is facing is the cost of repairs. This conversation surged to a new high earlier this week when Edmunds associate editor, Travis Langness, put the new F-150 to the test. Taking a sledgehammer to the side of the bed, Langness then put a few serious dents in the aluminum truck and proceeded to get an estimate from a local Ford dealer that was well-versed in repairing aluminum. In the end, Langness ended up paying $2,938.44 for his aluminum fix; that’s including a fortuitous circumstance that allowed him to snag a 50% DISCOUNT in labor costs. Even with that discount, though, the cost of repairs ended up being over $600 more than the cost to repair the same steel problem. But how much more would it have cost if Langness didn’t get the labor discount? A whopping $1,800 more!!! That $1,800 difference, of course, is more in line with the prices that most of us would face. So, lets get this straight: the cost of repairing aluminum is oftentimes twice as expensive in labor costs, while also taking double the amount of time. In total, that equals one hell of a hit to your wallet! 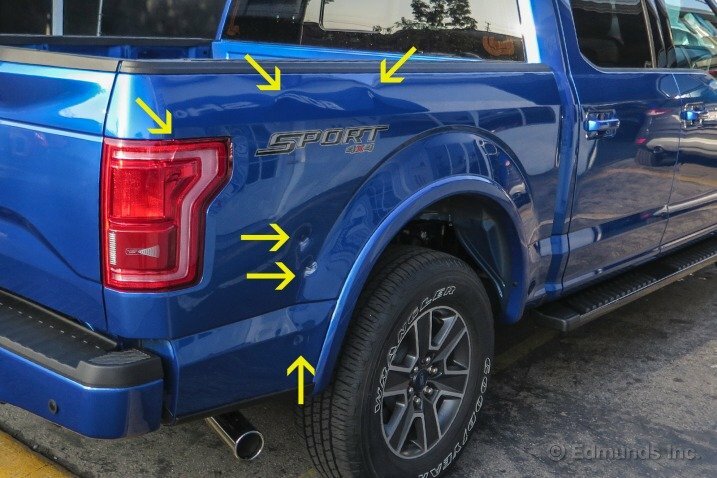 This entry was posted in Ford, Trucks & SUVs and tagged aluminum, aluminum truck, cost, edmunds, f-150, fix, ford, Ford dealer, more expensive to repair, repair, Travis Langness. Bookmark the permalink. I appreciate the article on the aluminum and the benefits and possible downfalls of it. I had no idea that aluminum doesn’t have any issues with rust. My brother is looking into a truck and is especially looking into aluminum due to its fuel efficiency. I will share this article with him so he can learn more about it and whether or not he wants it.